Whenever the "battery low" popup appears in my tablet, the brightness goes to full. This makes no sense because the brightness should be decreased to the minimum instead of going to the maximum, as battery is low. This is also annoying as I have to lower the brightness. I've looked in the settings to disable this but found no such option. So, How do I prevent brightness from going 100% when the battery low popup appears? I am running Android Kitkat 4.4.2 and my tablet is not rooted. Automation is the preferred option, or rather only option in this case, since Android OS does not offer any settings for requirements quoted. Many apps are available. I prefer using MacroDroid , since it is free (upto 5 macros) and easy to learn. Note: the solution below requires your Android to be rooted. I believe that automation without root wouldn't straightly deal with the issue, since it is not changing or overriding anything, but doing its own stuff over the existing changes. I was about to post on similar lines until I realized that the key to the solution is a file named max_brightness, a file under /sys, hence a part of Linux kernel and directly managed by it. I found that setting the brightness limit in that file is the best way to go here. You may disagree with a better solution. I noticed that once your custom maximum brightness is set, neither Android nor an app was able to set brightness beyond that custom level unless they changed the content of that file, which often an app has no reason to and none of them changed either. Besides, the file is owned by root and is part of group root, so any app or even system_server would require root privilege to make changes into that file. Finding that file is bit tricky. In my MTK device with Android 4.2, that file appears to be under /sys/devices/platform/leds-mt65xx/leds/lcd-backlight/. In my Qualcomm device with Android 5.0.2 and above, the file appeared to be in /sys/devices/mdp.0/qcom,mdss_fb_primary.168/leds/lcd-backlight/. The location where lcd-backlight is mentioned was the only one that made sense to me and this is how I found the file in my device. Don't you worry asking about others. I attempted changing the brightness of the screen and looked for the changes in the file named brightness (also located under those said locations). None of them reflected the correct output other than the one at /sys/devices/mdp.0/qcom,mdss_fb_primary.168/leds/lcd-backlight. adb shell su -c 'echo LIMIT > PATH_TO_MAX_BRIGHTNESS'   # in my case PATH_TO_MAX_BRIGHTNESS is /sys/devices/mdp.0/qcom,mdss_fb_primary.168/leds/lcd-backlight/ and set LIMIT to a value less than 30 (not limited to). 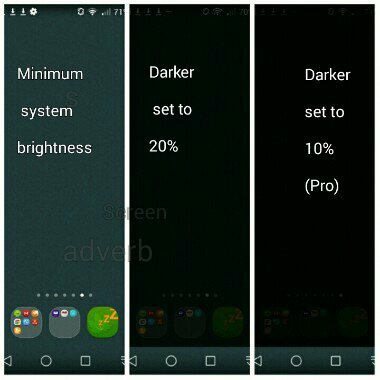 Now try maxing the brightness by using brightness slider or a third party app and you would notice that the brightness of your screen doesn't exceed beyond a certain point even when slider or the app's configuration appears to be at maximum. The brightness for that "certain point" would certainly be less than the default one you are used to. Note that the maximum value in max_brightness is often found to be 255 and the brightness ranges from 0-255. Often, not always true, that is. And fear not from setting the limit to 0. It would cause the screen not to lit until you revert the changes or restart the device. Find a limit which would not disturb you in your sleep or drains the battery heavily when battery runs low on juice. For automation, use any automation app that can run a command with root privilege and when the context of your preferred trigger is met. I recommend a time based trigger. Make sure to install all the permissions the flow require. As you would've guessed, you would have to setup two profiles for every app. One to setup a limit and the other to set the maximum brightness to the default you're used to. Alternative: Event → System → Intent Received → leave everything untouched but set the Action to android.intent.action.BATTERY_LOW. I would like you to keep this under consideration that using a low battery or 100% battery trigger would defeat the purpose of this answer, which is to override the changes Android want to make. As an example, if you setup LIMIT to 0 whenever the battery reaches 100%, what would happen is your Android would lit the screen to maximum as usual and in few milliseconds (you read correctly) your automation app would run and set the limit. Your sleep may get interrupted in those milliseconds. In an another situation, when low battery intent is broadcasted by system, Cool Guy's tablet may end up with a screen lit to maximum and in few milliseconds, the brightness would fall back to LIMIT. The workaround is to set up the battery level to 16 or more for battery low trigger and 99 or less for full battery charge. Not the answer you're looking for? Browse other questions tagged 4.4-kitkat charging screen-brightness or ask your own question. How to set one Ringtone for Contacts and another for non contacts? Decrease default vibration length on notification? Custom ring tone for callers who block their caller ID? How to launch app when phone is connected to a specific Qi wireless charger? How can I tell if I need to replace my battery? Can I prevent my S6 from reducing brightness at 5% battery?